Columbia students and staff served lunch to hungry teachers from around the Capital Region in between sessions at last week’s Regional Professional Learning Day, and collected about $1,800 which will be donated to the Save the Children Hurricane Relief Fund. 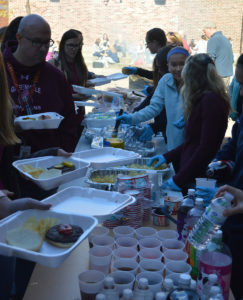 Assistant Principal Timothy Malloy cooked burgers and hot dogs on two grills in the courtyard while student leaders, PTO volunteers and Assistant Principal Patty Farnan dished out snacks and beverages. Each lunch cost $7, and thanks to donations from Price Chopper, The Rotary Club of Southern Rensselaer County and the East Greenbush Police Department, Columbia was able to make a significant donation to a worthy cause. “I’m proud of our students and staff and thankful to our local businesses for making this such a successful event,” said Columbia Principal John Sawchuk.